Like many, I’m a huge fan of getting the greatest value from every dollar I spend. This is one of those cases, where I’ll reintroduce a card into my wallet, specifically the Chase United Explorer Card. Why? 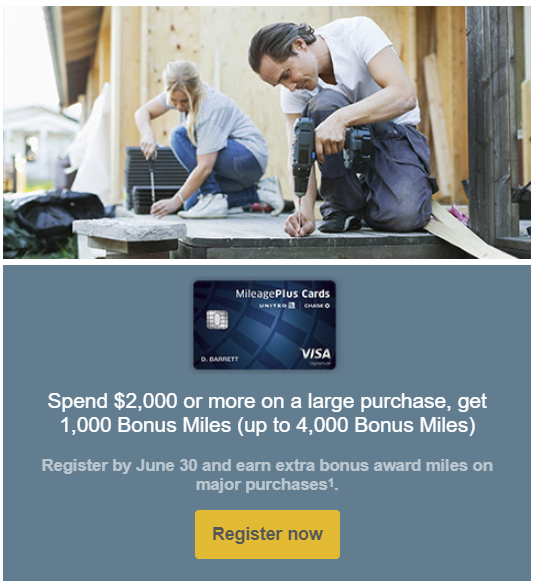 Because Chase is running a promotion with the United Explorer Card that means you can earn up to 4,000 Bonus United Mileage Plus Miles. * Additional 1,000 miles on purchase transactions of $2,000 or more: To be eligible for this bonus offer, you must log on to the website referenced in this offer and enroll by 06/30/18 11:59 p.m. ET. You’ll earn an additional 1,000 miles, up to a maximum of 4,000 miles, for the entire promotional period, on purchases of $2,000 or more when you use your United MileagePlus® Explorer or Awards Card credit card for transactions from 04/15/2018 through 06/30/2018. A purchase transaction must bill and post to your account in an amount that is equal to or greater than $2,000; for example, purchase transactions with items that ship at different times and bill in amounts less than $2,000 will not qualify for this bonus. Your bonus miles are calculated each billing cycle based on the number of purchase transactions of $2,000 or more during the promotional period that falls within that billing cycle. Miles earned in a monthly billing cycle are generally available to be used at the beginning of the next billing cycle; bonus miles earned on purchases made near the end of a billing cycle may take up to one additional billing cycle to become available. You’ll see miles you’ve earned on chase.com and on your monthly card billing statement. See Rewards Program Agreement for details on qualifying purchases. Bonus miles are subject to the Rewards Program Agreement. Credit card product changes during the promotional period will forfeit this bonus offer. To qualify for this promotional offer, account must be open and not in default at the time of fulfillment. This promotional offer is non-transferable. This is a limited time offer. United and MileagePlus are registered service marks. Miles accrued, awards, and benefits issued are subject to the rules of the United MileagePlus program. Taxes and fees related to award travel are the responsibility of the passenger. Additional terms may apply. For additional details of the MileagePlus Program go to united.comOpens Overlay. While 4,000 miles aren’t amazing, every little bit helps, and when you do pursue these types of promotions, the miles start to accumulate quickly. For 4 transactions of $2,000 or more, you can essentially earn a minimum of 1.5x on your spend, if you do $8,000 total in spend across those 4 transactions. Were you targeted to earn up to 4,000 Bonus United Mileage Plus Miles? Will this bonus be enough for you to put your United Explorer card back in your wallet? so where’s the sign-up link? I’m sure there’s a referral link that I could find since I’m a cardholder, but, I’m not an affiliate blogger – I just try to share things that seem to make sense to share with my readers.